EXCELLENT QUALITY! -- BRIGHT DURABLE PRINTS -- FRIENDLY SERVICE! -- FREE SHIPPING ON ORDERS OF 6 OR MORE! Don't be limited by stock designs, house fonts, and generic logos. I custom design each sash to the exact specifications of the customer, including choice of fonts and pictures. Choose from one of my popular fonts or specify any favorite font you like. I have a wide assortment of graphics that can be added for no additional charge, and if you like I can add your logo as well. Since each sash is custom designed, there is not a specific character limit as you may find elsewhere. I have many years experience in unique sash designs, so all you need to do is send me an e-mail and let me know what you'd like printed on your sashes. I'll send you a color jpeg proof for your approval prior to printing, and no payment is necessary until after you have approved the proof. Pageant sashes are perfect for beauty pageants, homecoming sashes, prom sashes, parades, clubs, ceremonies, and events. I use a specially formulated ink that will not flake off the sashes, so they can be used again and again or kept as souvenirs. Print colors: Blue, red, pink, green, black, purple, orange, metallic gold. Compare and save! Cheap pricing doesn't have to mean cheap quality. 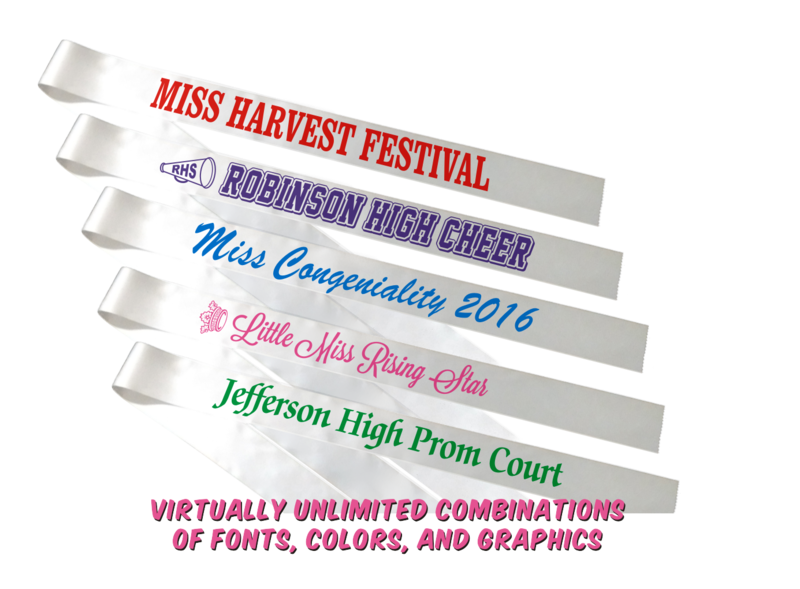 You will not find better quality printed pageant sashes for a lower price anywhere. I guarantee it! Please e-mail the wording you would like printed on your pageant sashes and desired print color and I will e-mail you a proof of the sash design for your approval prior to printing.No payment is required until proof is approved. Shipping (for quantities of 1-5): $5.50 for first sash, $0.50 for each additional sash. 6-10 of the same design: $11.50 each - FREE SHIPPING! 11-25 of the same design: $10.00 each - FREE SHIPPING! 26-50 of the same design: $8.75 each - FREE SHIPPING! 51-100 of the same design: $7.50 each - FREE SHIPPING! 101 and up of the same design: $6.75 each - FREE SHIPPING! For quantities lower than 10, please e-mail info@nshannon.com for pricing. 10-25 of the same design: $12.00 each - FREE SHIPPING! 26-50 of the same design: $10.75 each - FREE SHIPPING! 51-100 of the same design: $9.00 each - FREE SHIPPING! 101 and up of the same design: $8.25 each - FREE SHIPPING! To order, please e-mail info@endangerous.com the wording you would like printed on your pageant sashes and desired print color and I will e-mail you a jpeg proof of the sash design for your approval prior to printing. No payment is required until proof is approved.